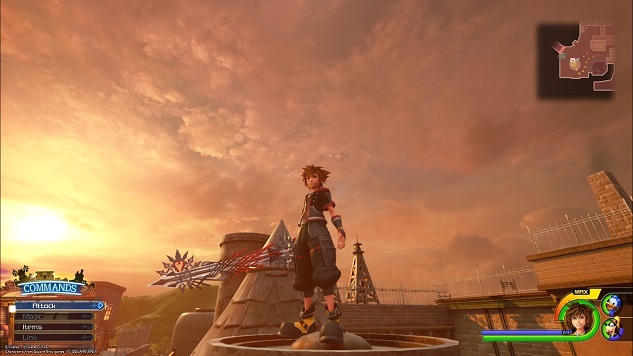 The journey doesn’t end when the curtain drops on Kingdom Hearts III’s final story beats. If you’re looking to tackle some of the game’s most difficult post-game fights then you’re going to want to get your hands on the most powerful weapon in the game : The Ultima Keyblade. To unlock this mighty blade you will have to put in a fair amount of work, as the prerequisites stretch across a number of different activities throughout the game, with some requiring you to reach near enough towards the end of the game’s story before gaining access to them. With that said, if you’re determined to get your hands on this powerful weapon then we’ve come up with a step-by-step guide to help you along your way. Before you do anything, you’re going to need to make sure you can actually make the Ultima Keyblade. 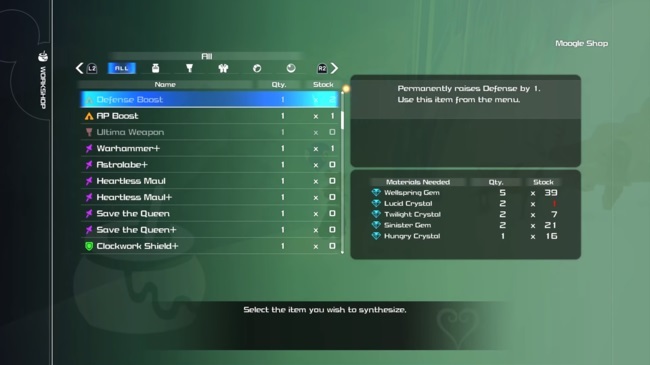 The blueprint to synthesize the weapon is obtained by collecting 58 unique synthesis items across the game. If you’ve already finished off the game’s story, it’s likely that you’re already more or less close to rounding off that total anyway. Some good ways to collect any remaining items you haven’t yet obtained is to go into a couple of Battlegates that are dotted around the various worlds as these will often throw large waves of specific enemies at you to help farm any missing materials. Most of the item types are broken down into four rarities, and it’s quite likely you’ll be missing the higher tier versions if any, so check for any gem or crystal tier materials in the list found in the workshop to see what you’re missing. It’s a good idea to stock up on Wellspring Crystals in particular as these can be used to craft the other crystal tier materials you might be missing to help save you a trip if you’re trying to round off your collection. The Wellspring Crystals are also a key component to make the Ultima Blade itself, so it’s always good to have a few on hand. The best place to farm these is in Battlegate #12, located on the rooftop of a building near the North District save point in San Fransokyo. A few trips into this relatively easy arena of monsters will ensure you have enough crystals to craft the keyblade. The hardest part of crafting the Ultima Keyblade is collecting the required pieces of Orichalcum+, a unique crafting material solely dedicated towards making the legendary blade. These seven pieces are scattered far and wide throughout the game, and some pieces require much more work to obtain than others. It’s worth noting that this is a material that will not appear randomly as a drop from asteroids or enemies, and can only be collected in the manner listed below. The best way to have access to every area you’ll need to visit is to make sure you’ve finished off the story fully, as well as making sure you’re using a modified Gummi ship with decent damage and health stats. 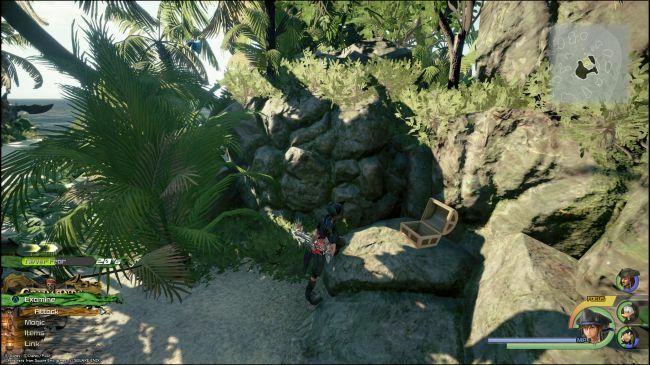 The first of two Orichalcum+ pieces located inside treasure chests, this particular piece is found in the Caribbean world in the center of Exile Island. Simply hop onto the save point on the Huddled Isles and sail across the gap to pick up the first of the Orichalcum+ pieces. The second Orichalcum+ piece found inside a treasure chest is located inside the Final World, which is accessed via the Keyblade Graveyard world. To get back to the empty plane of water and clouds, simply head over to the Badlands save point, then turn around and head back to the very first area where there should be a Battlegate and a red teleporter node. Use the red node and the chest will be straight in front of you in the Final World. 1. Cherry Flan, 20,000 points – Found on Olympus, located up the stairs from the Overlook save point. 3. Orange Flan, 23,000 points – Found in the Corona world, just outside of the secret tunnel that connects the Tower save point to the forest. 4. Banana Flan, 20,000 points – Found in Monstropolis. Head to the Basement save point and take the white door on the opposite side of the room. Follow the path until you come to a set of multiple doors, taking the brown one on the left. From here, turn left and head through the passage to find the flan. 5. Grape Flan, 20,000 points – Head to the Mountain Ridge save point and jump off the top of the mountain on the side between the shop and the save point. The flan is located in the clearing below. 6. Honeydew Flan, 15,000 points – Found on the building opposite the tower with the large “M” on it. Easily accessed by heading to the South District save point and climbing the tower directly behind the save point. 7. Watermelon Flan, 29,000 points – Found inside the central area of the Port Royal fort. While most of these challenges are fairly straight forward, the Orange Flan challenge can be quite difficult to achieve a high score on due to the vagueness of the rules set out in the challenge itself. During the Orange Flan challenge you’re tasked with taking seven photos of the nearby flans, with each photo being ranked on the subject. What it actually wants you to do is take a photo of the nearby flans during a very specific part of their animations, though it can be quite difficult to get the timing right, or even see what part of their action is being classified as the pose. The best way to get an excellent shot on all seven photos is to follow this route. Start by turning around at the beginning and locating the two small flans up in a tree, waiting for them to jump from the branch and transform into a cake that you then need to photograph. From here head up the nearby hill and find the five flans at top. Wait for them to pose twice, and on the third time they should all make the same pose which is when you take the photo. Head back down the hill towards the open cave to the left of the secret tunnel covered by vines to find the tiny flan that jumps out from the nearby bush. Photograph it when it is still posing then head further into the cave to find an even smaller flan patrolling around the central pillar. Follow that flan until it also poses, then take a photo of it and head back outside. Next find the flying flan to the right, waiting for it to reach the highest part of their hover before snapping them too. Now head around to the other side of the trees to find the flan with animals nearby that will start to climb onto it. Wait until the rabbit and both birds are on the flan before taking the photo when the flan makes a pose. The final photo comes from the flan in the nearby pond that will jump out when you get close. The correct timing for this photo is the moment the flan is fully out of the water with its hands up. Take your time with this one as the window is incredibly small, but thankfully if you miss it you can just back away and then walk back to make it pose again. Treasure #1 – Take the middle path and you’ll find it in the center of the three paths after the first jump. Treasure #2 – After the first jump, stick to the left of the map and continue hugging the left border. When you jump for a second time, continue to hang left and the treasure will be in a tunnel along this path. Treasure #3 – Jump over the first gap and take the central path. At the second jump pull left and take the passageway to the right of the trees separating this path from the one you followed for treasure #2. Follow this new path, sticking to the left routes where possible and you’ll find treasure #3 a short distance down the line. Treasure #4 – After the first jump take the path to the right and hug the wall until you go through a small cave. On the second jump here aim for the blue grind rail and at the end, pull left and land on the pathway below. Follow this down, heading straight until a large cave opening appears on the left with the treasure sitting inside the entrance. Treasure #5 – Follow the same path as treasure #4 all the way until you reach the end of the blue grind rail. Instead of taking the left passage, aim for the raised ridge in the center and follow it until it ends, where you’ll find the treasure sitting at the peak. Treasure #6 – After the first jump, take the right path and follow it along until you enter the cave. Make the second jump here but avoid the blue grind rail used in the last two treasures and aim for the upward slope behind it. Follow the slope until it becomes a third jump, during which you should aim to follow the central path to the right of the ridge below. Follow this passageway down, sticking to the wall of the ridge on your left and you will see the treasure a short distance down this path. Treasure #7 – Take the same path as treasure #6 all the way up until you reach the third jump. From here land on the passageway on the right of the central ridge and hang to the right of the slope down until you see a split with a pathway leading both left and right. Take the smaller passage to the right and follow it along to find the treasure standing before a small jump near some trees. Treasure #8 – Follow the same path you take for treasure #3 up until the point where you’ve passed the second jump and begun down the central passageway. Once you see the health orbs near the wall to the left, diverge from this path and take the central gap in the nearby trees which will launch you over and edge towards a third big jump. Leap off this cliff and look to the left to find a pocket of trees with a small passageway hiding in the middle of them. Aim to go through this gap and you’ll latch onto a hidden blue grind rail which will take you to the next treasure. Treasure #9 – After the first jump, take the path to the right and head towards the small cave. From this second jump land on the familiar blue grind rail and follow it until it ends, taking the right pathway to the ridge in the center. Follow this path down to treasure #7 and when you come to the third big jump aim for the blue grind rail in the sky. Leap between this rail to the next, following the series of rails that hug towards the right of the area and you’ll eventually grind right into the next treasure. Treasure #10 – Take the same route as treasure #5, heading through the cave where that treasure used to sit. Head off the big jump at the end of that cave and aim to land along the edge of this area on the right, hugging the wall until you enter the long ice floe tunnel. At the end of this tunnel take the passageway on the right, although if you’re going at full speed making that turn might be difficult so it’s a good idea to bump into a wall before attempting to turn right at the end, Once you enter the new tunnel take the small upwards pathway on the immediate left up onto the small ridge to find the treasure at the end. The sixth Orichalcum+ piece is obtained through the Moogle shop postcard gift system, which unfortunately means that obtaining this piece is down to luck of the draw. In order to obtain a postcard, all you have to do is spend Munny at any of the Moogle shops scattered across the world and then post the cards you receive as a bonus reward, so your best bet at getting this Orichalcum+ piece is to continuously stock up on items when your funds allow. Buying cheaper items like Potions will be much kinder to your wallet, and you can sell back most bought goods if you want to try and recoup a portion of funds spent trying to get this particular Orichalcum+ piece. In order to get this Orichalcum+ piece you will need to collect 80 of the Lucky Emblems that are scattered far and wide across the game’s many different worlds. These emblems come in all shapes and sizes, and while some are quite obvious, there are a few that are deviously disguised and difficult to find. If you’re looking for help in tracking down the Lucky Emblems to get your Orichalcum+ piece, head on over to our Lucky Emblem guide which shows the location of all 90 Lucky Emblems found throughout the game. To get the last Orichalcum+ piece you must defeat the Omega boss found in the Eclipse zone. Before you can tackle the big boss itself though, you must first win the five other fights located in the area. Four of these encounters can be found on the corner of the large space station at the center of the zone, with each fight taking place on the external face of the structure itself. The fifth fight can be found at the bottom of the station, directly underneath the structure. Once you’ve taken down all five enemies, the Omega boss will spawn on the roof of the station. The best way to tackle all of these fights is to make sure your Gummi Ship has a health pool and damage stat in the range of 350-400. Taking the self-repair power will also help you during the longer fights as it’s quite easy to get whittled down by stray bullets. Once the Omega ship has been defeated you will obtain the final piece of Orichalcum+. Once you’ve collected all seven Orichalcum+ pieces, make sure you’ve got two Wellspring Gems, two Pulsing Crystals, and two Lucid Crystals, then head over to any Moogle shop and open up the workshop to craft the Ultima Keyblade. Boasting a hearty stat pool of 13 strength/13 magic and a number of passive bonuses, the Ultima Keyblade is a force to be reckoned with, and now it’s all yours.